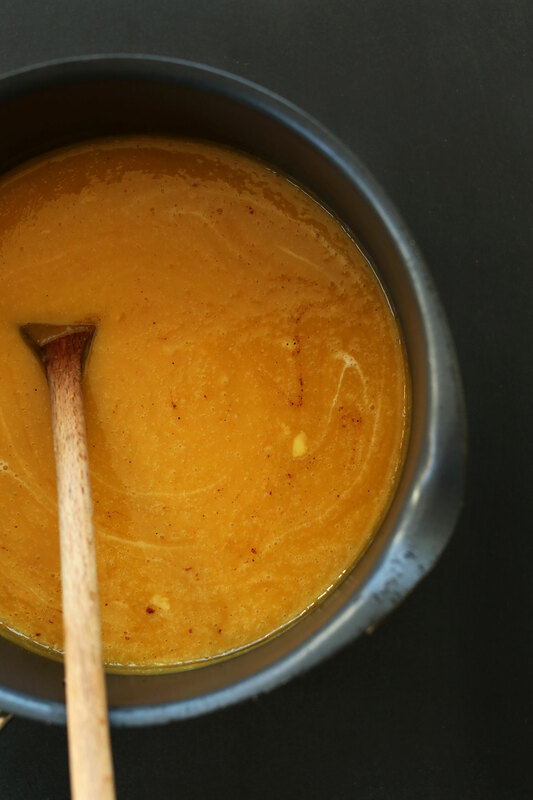 7-ingredient Pumpkin Soup made completely from scratch! Your mama’s gonna be so proud. It all starts with sugar pumpkins. 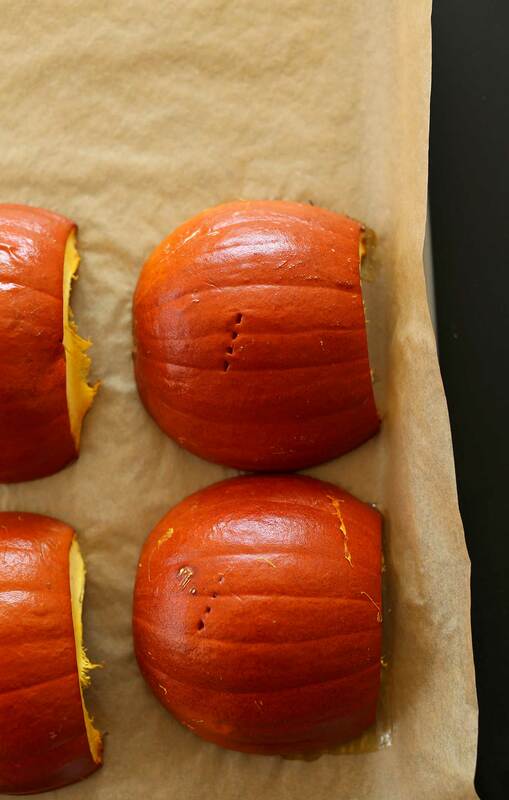 These little guys are perfect for roasting and turning into DIY pumpkin puree. Yep! You can do it yourself and it’s so easy; no store-bought puree necessary! 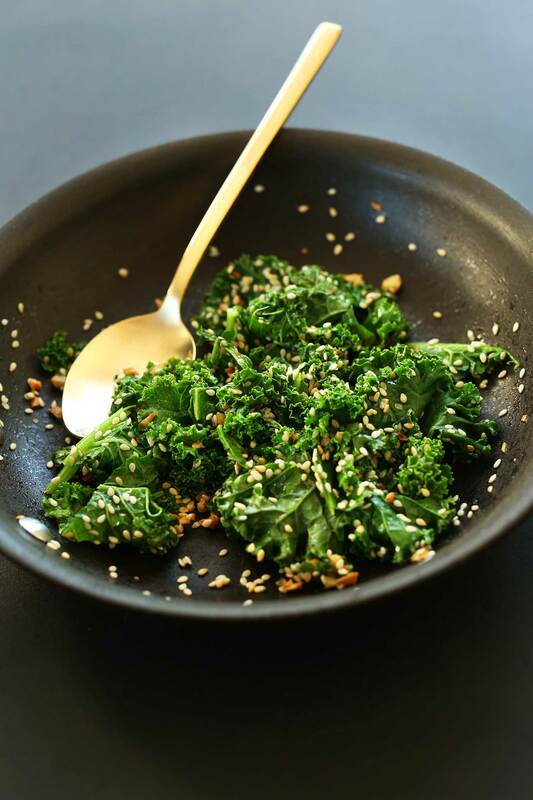 The kale-sesame topping it also easy, requiring just 5 ingredients. 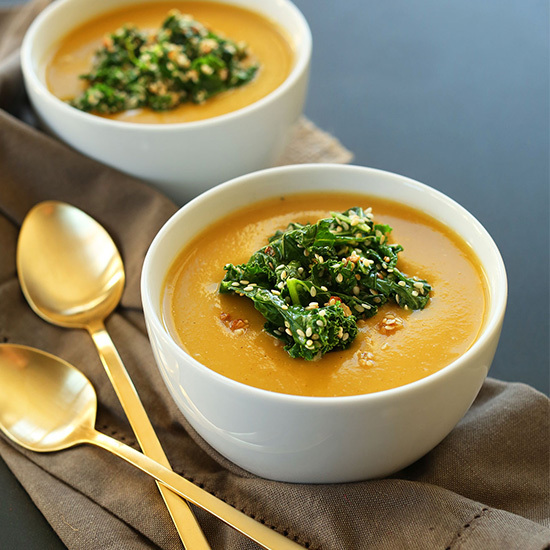 It adds a nutritious, colorful touch to this soup along with a little extra staying power. Your friends will be so impressed. It’s also customizable! If you don’t have the ingredients for a kale-sesame topping, sub garlic croutons or vegan parmesan. This soup makes a delicious light lunch or dinner, and would be perfect served alongside hummus and toast or a hearty salad. If you give this recipe a try, let us know! Leave a comment or take a picture and tag it @minimalistbaker on Twitter, or #minimalistbaker on Instagram. We absolutely love seeing what you guys cook up. Cheers! 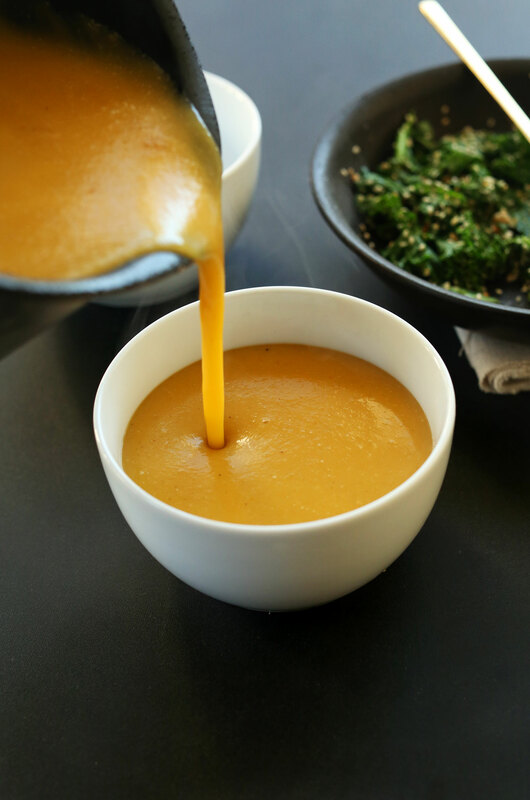 A simple, 7-ingredient pumpkin soup that's savory and made completely from scratch! Healthy, satisfying, and perfect for chillier weather. Using a sharp knife, cut off the tops of the sugar pumpkins and then halve them. Use a sharp spoon to scrape out all of the seeds and strings (see notes for a link to roasting seeds). To a large saucepan over medium heat add 1 Tbsp olive oil (amount as original recipe is written // adjust if altering batch size), shallot and garlic. Cook for 2-3 minutes, or until slightly browned and translucent. Turn down heat if cooking too quickly. Transfer soup mixture to a blender or use an immersion blender to puree the soup. If using a blender, place a towel over the top of the lid before mixing to avoid any accidents. Pour mixture back into pot. Recipe serves 3-4 (as originally written). Leftovers keep in the fridge for up to a few days and in the freezer for up to a month or more. *Nutrition information is a rough estimate calculated with kale-sesame topping. 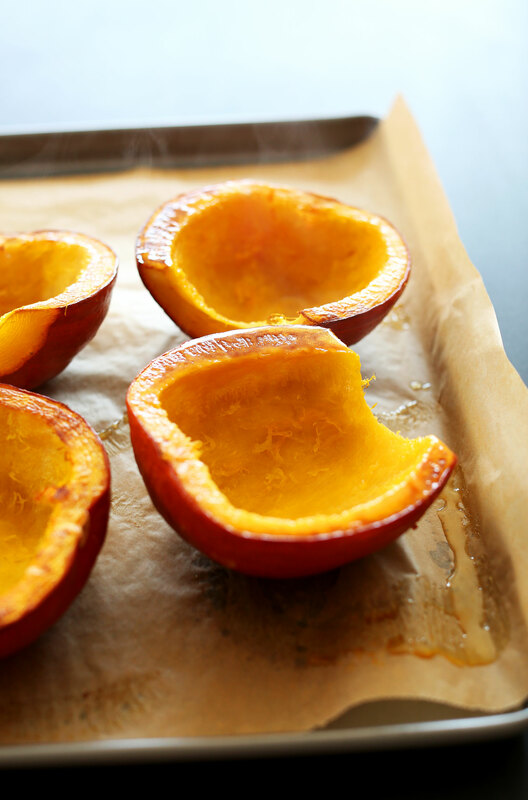 *Pumpkin roasting instructions from Oh She Glows. *If you’re feeling ambitious, here's how to roast your pumpkin seeds. This recipe is wonderful – just the way it is. No additional modifications required. This is the first time I’ve ever posted a comment about a recipe – I loved this soup so much that I needed to tell you! Thank you! Easy recipe and delicious. I used the roasted pumpkin recipe and used the link to find this soup recipe. I used a pie pumpkin, but don’t know what kind, and did not measure the amount. I modified the recipe using a whole can of full fat coconut milk, adding it to the blender instead of cooking it with the other ingredients. I used a dry broth mix with water instead of salt or broth. Used only one shallot, no garlic. Your suggestion for nutmeg and cinnamon, and extra maple syrup. I had croutons on hand, but will give the kale topping a try. Next time, I will add more cinnamon and nutmeg to my recipe. Thank you for this easy to follow, delicious basic recipe. This is an awesome recipe! I switched it up by adding 2 cups of spinach in with the onions to simmer, added an avocado, and added smoked paprika and chili powder. The result was a creamy soup with a nice zest in addition to the cinnamon! Great! We’re glad to hear that, Renee! My husband said he would expect this from one of our favorite restaurants with a high end chef! I enjoyed making this a lot. Paired very nicely w the roasted seeds and roasted Brussels Sprouts. So happy to have made this soup! It turned out thick with a hint of sweetness, which I love. I used almond milk instead of coconut milk, but otherwise, I used all the other ingredients as listed. Such a treat for fall. Thank you! I loved the creaminess of the soup but did not like the taste of coconut milk in this recipe. I do like coconut milk and enjoy it in other dishes, but here, it did not work for me. It left an aftertaste. Very good soup! I added more of each spice and a bit more honey because it wasn’t flavorful enough for me as written. After than modification it was delicious! I roasted the pumpkin seeds and also added them to top the kale. Yum! I made this soup! I used another kind of pumpkin as sugar pumpkins aren’t sold where I live. But!!! This recipe for pumpkin soup is the best I’ve ever made. The only change was that I made the kale crunchy instead of wilting it. It gave the soup, I thought it needed a different texture to it and it turned out beautifully! Fried garlic and sesame seeds apart and kale apart. This was the smoothest, creamiest, most delicious pumpkin soup I’ve ever made, thanks for that!!! I made this yesterday for a church potluck dinner group and it turned out quite well. I had to change up this recipe some because I didn’t have all the ingredients listed. First, I only had canned pumpkin, so that was a compromise I had to make. It still worked out well in the end. I also had no shallots, so I compensated by adding thyme, sage, and paprika to the soup to jazz it up a bit. And instead of coconut milk, I had macadamia nut milk on hand. Otherwise I followed the ingredients list. I cooked the soup in my crock pot for four hours and stirred every ten to fifteen minutes. It thickened up nicely as it cooked, and I’m consuming the leftover today to keep warm. Thanks for sharing your recipe changes, Michael! This recipe is so rich and full of flavor. My boyfriend loves it and has asked me to make it for his family Thanksgiving. I customized the recipe by adding crispy pancetta to the kale. Awesome recipe! Sorry, just to clarify – to make the pumpkin purée do you simply roast the pumpkin halves as directed and then blend the flesh once cooled? No additions? And how long will it last, please? Hi Clare, I roasted the pumpkins I used, For a bit longer in the oven because of a different kind of pumpkin. As soon as you can put fork easily through the skin, they’re done! Cool the a bit, scrape off the peel and hold aside the flesh. And then follow the rest of the recipe! It’s soooo good!!! I substituted the vegetable stock for beef bone broth. So freaking delicious and easy!! Thank you! This was very tasty and my 7, 5 and 2 year old all liked it! I added some pumpkin seeds and croutons on top as well along with canned unsweetened pumpkin puree. Quick recipe that was delicious and filling. I used coconut cream to make it a bit thicker. Thanks! This was great! Our guests loved it so much, they asked to take some home for a relative of theirs who wasn’t able to join us for dinner. For the leftovers, we didn’t have any more kale, so instead we added a can of chickpeas to the soup to add some extra protein. Also very tasty. Do you think this would work as well with organic canned pumpkin purée? I used this recipe after buying a white pumpkin and not knowing what to do with it. I was pleasantly surprised! It’s got some heat from the black pepper! Nice to know that my unused immersion blender works too! It came out super dreamy creamy. I used 2 tablespoons of sugar free maple syrup instead, it’s not that sweet so I might a little more! Thank you so much for this recipe! Great! Thanks for sharing, Lori! Made this for dinner tonight & it was a hit! We don’t have sugar pumpkins here in Jamaica unfortunately, so I used regular pumpkins & added a tiny bit more maple syrup. Perfection. Really nice recipe ! Thank you ?? This is my third time making it today. The first time I followed the recipe. I used leek once and this time red onion. Hoping it’ll be just as good ? I honestly cannot say enough how much I love your site/blog. I’ve made countless recipes and have loved them all (and shared EVERYTHING with any friend or family member that will listen) but have never commented. Made this recipe tonight and loved it, just as everything else I’ve tried! Thank you for sharing awesome, realistic, and fun plant based dishes!!! This is so yummy! I did my own mix with the spices – salt, pepper, a little cumin, berbere, and cracked rosemary. Also I used one sugar pumpkin and one butternut squash, and used full fat coconut milk. Finally, for the topping, I did not have any sesame seeds but had roasted the seeds from the pumpkin and butternut squash – I tossed that with the kale instead – delish! 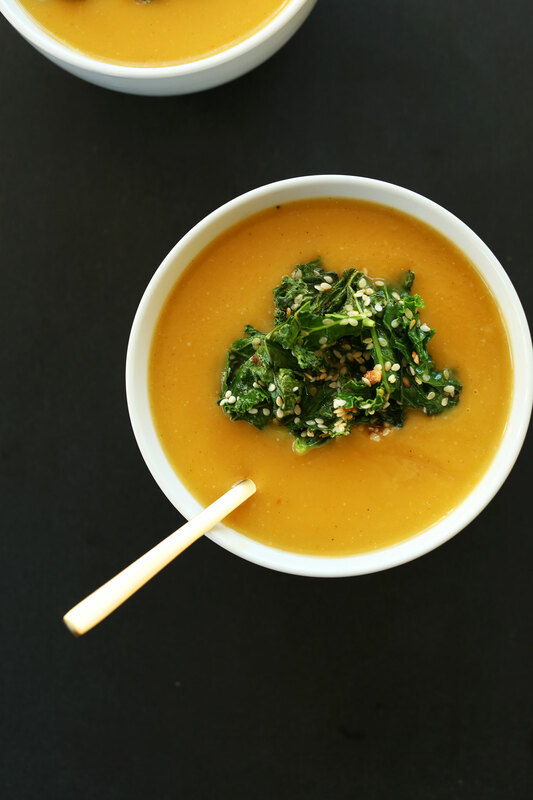 This soup was wonderful, and I also loved the sesame kale topping! My modifications included using 1 TBSP of honey, and adding 1 cup of diced roasted pumpkin to make it a chunky soup. Between steps 5 and 6, I was concerned that putting something that hot into my plastic blender jar might ruin it, so I had to let it cool for about 20 minutes before blending it. Next time, I would also add just a dash more salt. Absolutely delicious. I used applesauce instead of sweetening and added a bit of cinnamon. Delish! Easy recipe to follow. Lovely pictures too. I made mine with real organic pumpkin and organic kale. I made no changes, except that I didn’t want the coconut milk that was left to go to waste so I just added the rest, a little more veggie broth and a little more maple syrup. It turned out great and I have a little extra for leftovers. A friend pointed out your site and I’m glad she did. I’ll be back looking for recipes. Thank you! I was very disappointed with this recipe. Way to thin and flat tasting. Hi Dana this looks awesome – any thoughts or modifications on this for an Instant Pot? Thanks! I don’t have one and can’t recommend. Sorry! This was so delicious!! Used canned pumpkin though due to a time crunch. Made it for a dinner party, potluck style. Turns out every recipe at the party that night was from minimalistbaker ?? And everything was amazing. I always process and puree sugar pumpkins. Since I had a fresh batch of puree, I made this soup tonight. Absolutely perfect. Didn’t make the kale chips, no kale on hand, but the soup is spot on. Already shared it with a friend who is now roasting her own pumpkins now. I give this recipe 2.5/5. I didn’t think think there was any depth to the flavor, it was all the same note. I’m not sure what it could use maybe double the garlic? So delicious! 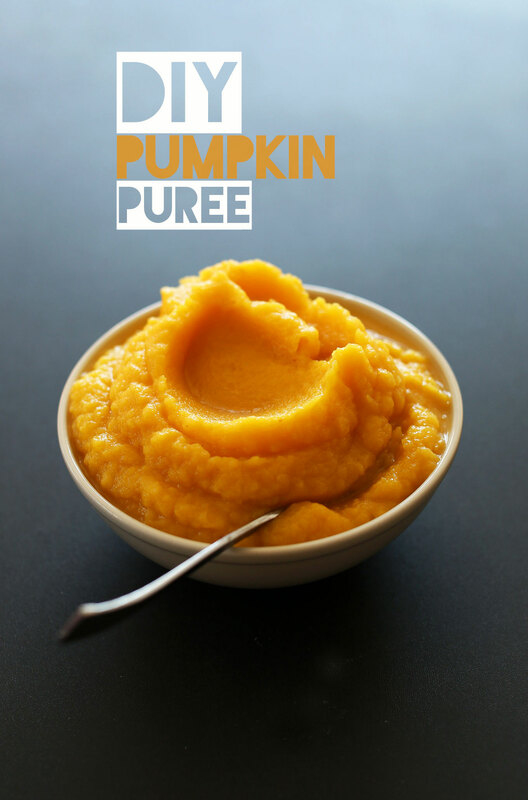 I didn’t have time to roast the pumpkin, so I made it with canned puree and it was sooo good! The sesame kale is a great addition. The ingredients list calls for Pumpkin puree but as I follow the directions, it’s doesn’t say to puree the roasted pumpkin. It says, peel, set aside and then later add Pumpkin to the pot before blending the soup. So do I add 2 1/4 cups roasted pumpkin or Pumpkin puree?? Hi Jamie! Either would work because you are blending it after! Family loved this soup! I added curry, slivered almonds and coconut flakes to kale rather than sesame seeds. Just thought you missed an autocorrect mistake – I imagine you meant immersion not emulsion blender. Thank you for giving me a start on making pumpkin soup! I used what I had on hand and it turned out great. 1 carrot and 1 rib celery in fine dice, sweated in a bit of olive oil. Added 1 can pumpkin puree, 2 cups water, 1 cup almond/coconut milk, ¼ cup dried onion. Salt & pepper, cinnamon, nutmeg, garlic powder, and a bit of curry powder. After I tasted it, I added a bit of maple syrup to taste. Had no kale but will plan on that next time! One in our family loves cream soups but one other can’t have milk, so this is perfect. Hello! So I would love to make this right now but I can’t find sugar pumpkins anymore in the grocery store. Would it have a similar taste/outcome if I used acorn or butternut squash? And if so, which one would you recommend? Yes! That would be lovely, actually! Butternut squash or acorn would both work! I made this pumpkin sou. I used organic raw honey from costco, add 1/4 tsp organic turmeric (for anti inflammatory), and the garnish I used chopped walnuts instead of sesame seeds. Taste wonderful!!!! I just made this for Thanksgiving dinner tonight and it’s GREAT. Two people have snuck tastes and they really enjoy it! WHERE ARE THOSE GORGEOUS SPOONS FROM? My husband and I make this weekly. The first time we didn’t make the kale, and was great, but then we made the kale…next level amazingness. It’s super easy and the leftovers are delicious, we just mix the rest of the sesame kale in and it keeps it’s crunch. We puree the pumpkin/squash first, but don’t puree after to make it even easier. This was delicious. I was given 2 pumpkins on Halloween and wanted to make some soup. After searching online for a recipe, I decided to go with yours and so glad that I did! I just made this but with a couple minor variations. I forgot to buy paprika so that got left out, and I used canned coconut milk. I also cut the recipe in 1/2 since I only had 1 pie pumpkin, not 2. And I didn’t make the topping because my kale was in the freezer & I forgot to take it out. The recipe must be fairly forgiving because despite the differences it was still delicious. I will definitely be making this again and again! Yum. I made this. Yes the kale and garlic was a very tasty finish. thank you for sharing this recipe. This was really simple and delicious, thanks! I added a couple of roasted carrots and left out the maple syrup and it turned out really sweet and tasty. Made this on a cold October day and it was perfect. I halved the maple syrup as I like savoury over sweet dishes and it couldn’t have turned out better. Thanks so much @minimalistbaker. I’ll definitely be trying your other recipes. This was so delicious! Me and my husband just ate the whole lot in one sitting! I hope you roasted the pumpkin seeds too! I melted a tablespoon of butter in a small bowl in the microwave then added a teaspoon of olive oil. I added the pumpkin seeds and swirled them around. I spread them on a foil lined baking sheet. I sprinkled them with salt, pepper, chipotle powder and garlic powder then baked them at the same time as the pumpkin. They are great to sprinkle on top of the soup if you want something other than the delicious kale topping. oops I hit the submit button before I rated this a 5 star recipe! Love this soup. First time I made it I prepared the sugar pumpkins myself. It was good but the process turned my soup into an all day event. This time I made it again but I just used Libby’s canned pumpkin. I thought it was even more delicious this time and much easier! Yum! I am a soup-ruined, and I actually Mesa this and it’s great. Use smoked olive oil on the pumpkin, and toasted some pumpkin seed to put on top. Thank you! That’s supposed to be soup-ruiner ; it never turns out well. This did!!! This was incredibly delicious! I made this for friends and there was a good natured fight over the left overs. Made with pumpkin puree and honey instead of maple syrup. Will definitely make again! It would probably be good blended but I don’t have a blender currently so if you mix the ingredients and heat it, it is like chunky but creamy soup, delicious! I usually hate pumpkin but today I really wanted to turn things around and try out a recipe. This one was it! I’m already half through my first bowl and I really like it. It’s spicy, sweet but also savory. I feel so good about making it. Thank you so much for the cool recipe! Delicious… hosted 15 people at my house for a harvest lunch today and even the kids asked for seconds! Once again a winner! We have so allium allergies in our family so I didn’t put in the garlic or shallots, subbing with fresh ginger and it was divine. How can i make this have a spicy kick to it? I lived with an aunt for a while when I was a kid, and she made pumpkin soup all the time. It’s my absolute favourite, as it is belly-filling, and heartwarming. I tried making this wonderful recipe! I used Libby’s pumpkin puree for a quicker route, and Simple Truth Organic lite coconut milk. I used miso paste for the stock. It’s just my preference, but I wanted a little more spice in it–a little more kick. I added extra nutmeg, cinnamon, black pepper, equal measurements of paprika and turmeric. I did the same recipe for the kale topping, and added some walnuts to it for extra texture. Thank you veeery much for the recipe. You’re my go-to for delicious, easy meals! ***and also, I used 3 cups of pumpkin puree, 1 & 1/2 cups of coconut milk, and 2 & 1/2 cups of stock. I came out with about 27 laddle-fuls… really enough for about 6 or 7 people if served with something to compliment it. I baked some herbed rolls along. So good for a chilly January. This was so good! My first time trying pumpkin soup. I used a different soup recipe, but the kale topping was the perfect compliment. I used sunflower seeds because that’s what I had on hand. Delicious. I will make it again. This was delicious! I didn’t have kale so subbed spinach and didn’t cook it as long. Also used maple sugar (used less) instead of syrup because that is what I had. Just thought others might like to know that it was still good even with the subs! Thanks for the recipe! I also added some curry powder and cayenne to add some heat to balance the sweet. I had left out the maple syrup but still it was sweet and not quite balanced. I also grated in some fresh ginger and YUM. Love the creaminess. Thank you. This was really yummy! I added one teaspoon of hot madrasa curry powder for an extra kick and some spice. I also skipped the maple syrup and it turned out perfect! So happy I found this easy, yummy recipe! I’m using it for soup “shooters” for my Christmas cocktail party. :) Thanks Dana! Wow! Substituted some ingredients for ones we didn’t have on hand… For example, sautéd some carrots, celery and zucchini with onion, leek and garlic before adding water, pumpkin and coconut cream. (No broth, shallots or coconut milk) Just pulsed the blender a few times to leave small chunks in the soup. Such a delicious roasted flavor under the main pumpkin taste. Thanks for sharing this recipe! I did not have coconut milk on hand but used one tablespoon of coconut oil when sautéing the shallots and garlic…. turned out great with hint of the coconut. I made this a few days ago, it was really delicious! We thought the kale-sesame topping was perfect with it. This recipe will become our traditional Halloween night pumpkin soup. Thanks! In the recipe it says 3 to 4 servings. How many milliliters do you calculate for a serving? Love it!!! The baked pumpkin is the best part. This soup is SO good! I made it in a total of 15 minutes (the soup and the garnish) by using canned pumpkin. I can’t believe how easy yet amazing it is!! From one who recognizes your husband’s symptom, going off gluten COMPLETELY was the answer to my problem. Suffered through most of 2012, but have been fine ever since, except for occasional slip-ups. I made do with what I had at home, and the following substitutions also yield a really fantastic soup! I accidentally used a whole can of coconut milk but it’s so good it doesn’t matter. And I have no clue what kind of pumpkins I used.. They were part of my csa. Thanks! Tried this out with a few adjustments due to lack of ingredients. As I didn’t have coconut milk on hand, I used 1/4 cup of unrefined coconut oil, about 1/2 a cup of onions, 2 chicken bouillon cubes with 2 cups of water, and orange blossom honey. Turned out to be a thick and delicious soup! Being in the heart of the fall season here in Montreal means soup galore! Made a curry butternut squash soup recently (delicious) and figured to give this a try. To be honest, I was a little concerned about having pumpkin, because I haven’t been so keen on it in the past but the use of coconut milk and cinnamon held some promise. I’m SO glad you made this recipe, and I’m SO glad to have given it a shot. This has easily become one of my favorite soups! I’m actually going to buy more pumpkin tomorrow to make some more & stock up before the season is up. Just to note, I only found large pumpkins so I was more liberal with the cinnamon, nutmeg, salt and pepper. I also used a powdered chicken stock mixed with water (MSG free!) and used half a cup of coconut milk since it wasn’t light. Just perfect! Lovely delicious recipe! I “cheated” and used canned pumpkin because I was in a rush. I will try fresh next time. I also added in 2 ears shucked roasted corn, 1/2 tsp cayenne, omitted the puree step and added crushed corn chip garnish along with the sesame kale at serving time. This was super delicious, the first taste put an instant smile on my face. Thank you for sharing this wonderful recipe! Thanks so much for sharing! So glad you liked it. xoxo! It looks amazing and I will be making this for Halloween dinner this year! Can I use canned pumpkin puree instead of roasting sugar pumpkins? I am hosting for 24 ppl so I wanted to simplify the recipe a bit. Of course! Not sure how many cans, but I’m sure it will turn out! I just made some pumpkin soup before reading the Noom newsletter. I usually add some tomato puree to take away the blandness and use low fat cooking cream or low fat Greek yoghurt plus spices such as cumin and a little mild cayenne pepper. I never add anything sweet as I have type 2 diabetes. Outstanding recipe. I’ve made it 4 times now. Last batch was a little more savory than the prior ones, maybe because of how I measured the shallots, but still very delicious. Is 1 shallot = 1 clove or 1 whole bulb (sometimes 2-3 cloves per shallot)? I have also added cardamom because I adore it in many things pumpkin and otherwise and it also adds a certain “Je ne sais quoi” complexity to foods. This was really yummy! As per your recipe, the roasting took the most time, but it was fast after that. I roasted a few apples with the pumpkin to use in the recipe. I also threw in some hemp hearts in the kale mixture. I loved all of the flavors going on. I was too lazy to find the single spices, so I added pumpkin pie spice instead with a little extra cinnamon and it worked well. Next time I’m going to try cashew cream to see if it gives it a bisque-like texture. Thanks so much for sharing the recipe! It’s a keeper! This soup looks so yummy I’m gonna have to do this for halloween. Love the pictures and the golden spoons! Omg I absolutely loved this. I made it tonight and it was amazing. I used chicken stock, regular honey, and coconut milk creamer instead. I rarely use measuring spoons/cups but this combo worked perfectly. I also added a teensy bit of chilli pepper to balance the sweetness. 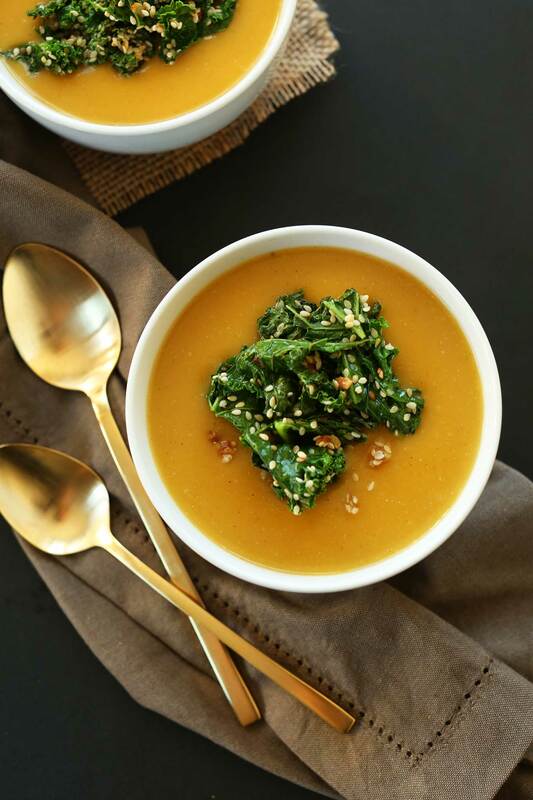 I’m obsessed with the sesame kale topping – a low carb way to add a crunch to soup. Thank you! Wonderful! Thanks for sharing, Kate! making this right now! one question… when you say 2 shallots do you mean 2 shallots or 2 bulbs? this is my first time cooking with shallots so i’m the new girl over here. :) super excited about this soup! 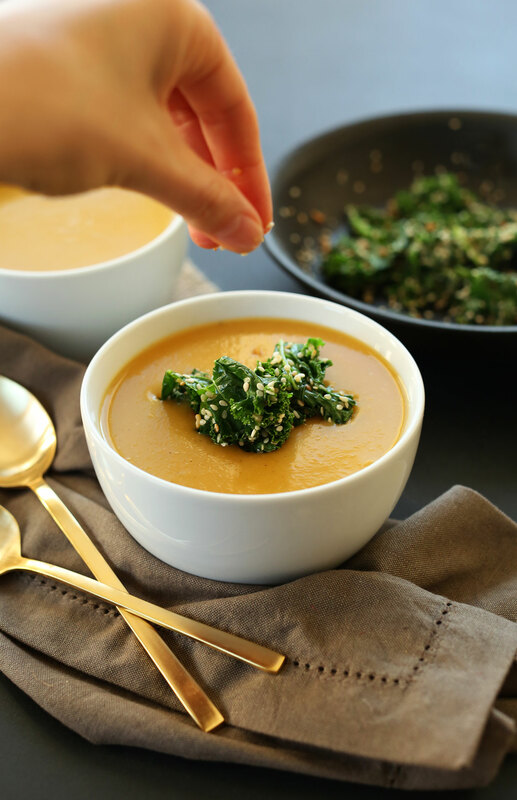 I love all things pumpkin, definitely going to make this soup! I was thinking kale chips would be great to add some crunch? Absolutely! If you need a recipe, try this one and scale back a little on the nutritional yeast! Great recipe! Tasted great, only this g I’d change for next time is less maple syrup. I found it to sweet. I made this today using pumpkin purée I had saved in the freezer. It was 100 degrees outside so I chilled it after cooking and served it cold. It was delicious and very refreshing! I was concerned it would be heavy but it wasn’t at all. I made this over the weekend and it turned out delicious! I had to use canned pumpkin because I couldn’t find any sugar pumpkins at the market (in March! ), but it still came out yummy. Next time I will have to track down some fresh pumpkin! Can I pressure cook the pumpkins instead of roasting in the oven? Takes less time and saves electricity. But, would I be compromising on the taste? Please advise. A good friend of mine go out for dinner once a month and, in the fall, we exclusively go to a tiny place that makes unbelievably delicious pumpkin soup. Tonight, for our monthly meet-up, I decided I wanted to make pumpkin soup because I always want leftovers. My house smells so good now – so glad I found your recipe!! I have one question – will it thicken on its own as it simmers, or do you recommend adding a thickener? Easy and delicious. I didn’t use any sweetener beyond coconut milk. When you feel like a little heat, stir in a heaping tablespoon of red curry paste (I used the little Maesri tin) and balance that with a healthy squeeze of lime juice. Top with plain Greek yogurt and chopped cilantro (instead of kale). Oh yeah, forgot to mention: I don’t even have a blender. I just stirred it with a regular spoon. Still great. Just made this soup on a cold, wet night. Simply wonderful! Especially liked the kale garnish and will double the recipe for it next time. Thanks! Made this the other day and it was amazing! I didn’t have enough pumpkin but it still turned out okay, although I put too much pepper in. Very filling, too! I haven’t used shallots much and I bought two dried pods. Would it be two cloves of it for the recipe? I’m thinking not two whole shallots. Thanks. Just made this soup the other night! Very simple and straight forward and the soup tasted amazing! Ah, yay! Hope you love them both, Kelzee! This turned out bomb. I added some pumpkin spice and cayenne pepper for extra heat and it blew our taste buds! I also didn’t have any milk so I put couple tbls of cashews and water. Thanks for another awesome recipe, you never disappoint! I made this for my better half. She and I loved it. Thanks for the tip! I made this soup with homemade pumpkin puree for dinner this week and it is delicious! Unfortunately mine isn’t nearly as colorful as yours, which may be due to the white pumpkin I used, but it’s still so tasty. Thanks again for another wonderful and (more importantly) simple recipe! You rock. Thank you for your reply. Could I use rice milk in every recipe that calls for almond milk? My husband and my son are sensitive to soy milk and with my nut allergies, have to have a sub. I am allergic to all tree nuts and wondered if I can substitute rice milk for almond milk and what flour would I sub for the almond flour or other tree nut ingredients? I can eat pumpkin seeds but even sesame seeds bother me. Any suggestions would be greatly appreciated. Being a two time cancer survivor, I am ready to take mine and my family’s nutrition to a better level. Yes! Rice milk should work well in this recipe. I couldn’t find sugar pumpkins so I baked sweet potatoes instead. Then made kale chips with sesame seeds to top it off. Delicious! Thanks for a great recipe. I love everything about this. Pumpkin soup! I absolutely adore that. I am also quite taken by your kale topping with the sesame seeds. The contrast in colors adds a kind of wow factor that I think would impress Thanksgiving guests for sure! I also like that you offer suggestions if people don’t have those things, I think that’s really nice, but no surprise there because you two are just the sweetest people :) Anyway, love the soup and all of your fall recipes! Keep em coming! Ah, thanks Lynn! I just go ahead and assume people don’t have crazy things like sesame seeds and fresh kale in their pantries at all times (even though I, in fact, am one of those weird people). Cheers! This looks so simple AND so delicious! Can’t wait to try it! 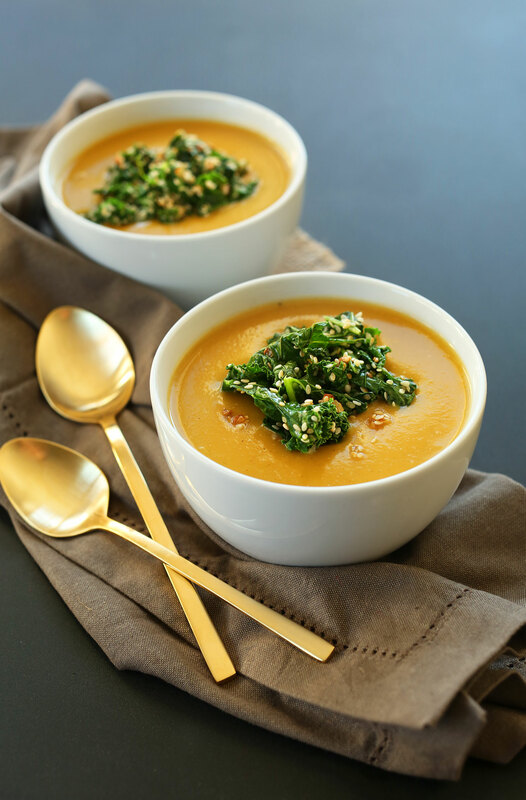 This looks simply delicious; and I was planning on making pumpkin soup for dinner tomorrow; I’ll be sure to give it a try! That first photo is simply stunning, by the way! I am the same way with wearing a scarves inside. It’s actually been warm here this week but it’s still freezing inside our house. I’m wearing a fleece as I type this. Also, we’re orange soup twins today. Love the kale and sesame seed topping you have going on. I’m waiting for dinner right now and your photos have made me even hungrier! Love pumpkin soup, yum! I DO have all of those ingredients on hand. This looks great :) May have to make this for lunch…it’s freeeeezing! You have to love hearty winter greens with sweet, rich winter squash. This sounds perfect for a rainy night! This sounds great. do you think it would taste okay without the syrup? I am currently not eating any kind of additional sweeteners (whole30)? I do! I like how the sweetness enhances the savory, but I think the coconut milk adds enough natural sweetness to work here. Good luck! I just made it and think it is too sweet. I am thinking no maple syrup would be ideal. Thank you for this recipe. My hubby does not enjoy spices so this fits the bill to a T.
Hmm, rice milk should be good! Or almond milk. Cashew milk is really nice and creamy. Simple and gorgeous!! Loving the kale topping especially. It is amazing how all of us food bloggers are posting awesome soup recipes throughout this week. I am amazed, in a good way, at the synergy happening between both of our recipes look! Must be in the same mind state. Check my recipe out at. Yay! Gawwwwgeous per usual. Are those spoons from West Elm!? I love this – pumpkin soup is a big thing over here in Belgium! They don’t sell canned pumpkin puree here so I started roasted my pumpkins in the oven when I moved here and have never looked back :) This soup looks absolutely perfect! Cannot wait to try – Pinned! I made a very similar soup on Tuesday. It’s definitely that soup craving time of year. I love the idea of topping it with kale! 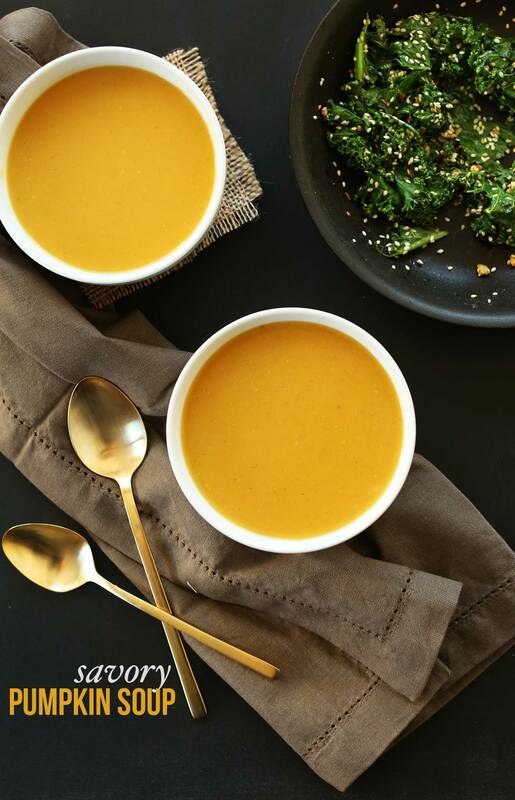 Next time I want to make it with my own pumpkin puree (and top it with kale). I’ve never tried it before and I’m sure it’s significantly better than canned! I cannot wait to make this recipe! Looks delish! Goodness gracious. My grandpa has his OWN pumpkin patch, yet I’ve never roasted my own pumpkin. That will change this year. This looks insane! Where did you get those gold silverwares? They’re beautiful! I currently have a smallish pumpkin and acorn squash on my counter and this is what I’m going to do with it Saturday. Thank you for giving me the inspiration to not let those vegetables go to waste! I am a big fan of the kale sesame topping, both for the added texture and pop of colour, looks so great! I’ve never been ambitious enough to make my own pumpkin puree, but you may have inspired me. :) Pumpkin soup sounds perfect for this upcoming cold weekend! I grew.sugar pumpkins in my garden this year, and lucky me, I’ve already.cooked and pureed them, and they’re waiting in my freezer. This soup looks like the perfect way to use some of them! DO it! And let us know how it goes! Lots of work to cut the pumpkins, but after that it is easy! I diluted with more broth and coconutmilk. Great Recipe! Looks so delicious Dana! I love making pumpkin and squash soup as they are so naturally creamy! I also love adding cinnamon for a touch of warmth and sweetness!